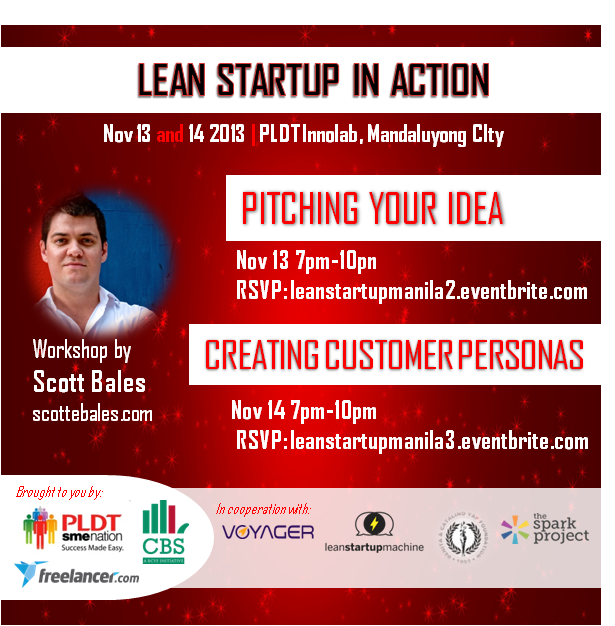 Sirfaraz Piracha, the Growth Manager, Europe And Asia Lean Startup Machine recently got in touch to encourage us here in Manila to get a move on it and secure those last mile sign-ups required to bring Lean Start Up Machine to Manila this 2014. Check out more about Lean StartUp Machine here. NOTICE TO THE PUBLIC: On behalf of LSManila community and our partners, we sincerely hope that your family and friends in the Visayas region are safe and sound. In light of the recent calamity, we feel its most appropriate that all resources be directed to ongoing disaster assistance endeavors. LearningOpp: Pitching Your Idea, scheduled to occur on Wednesday, November 13, 2013 7:00 PM has been cancelled. LearningOpp: Developing Customer Personas, scheduled to occur on Thursday, November 14, 2013 7:00 PM has been cancelled. These events will be rescheduled if not before the year ends then early January. LSManila will be having a meet-up before the month ends (November) so stay tuned for the details of that or better yet, join the MeetUp Group here to be notified. I highly encourage you to help out in any way you can – through cash and in-kind donations and by being generous with your time and energy in assisting relief operations.A list of relief operation centers can be found on Rappler. Let’s face it; Venture Capitalist and Angel Investors don’t get much time to here pitches. The result of thousands of new entrepreneurs, innovators or ideas results in a mass of ideas to sift through. So how can you stand out from the crowd? We are living in the age of the entrepreneur — more people are starting up, and it’s ever important to stand out in the crowd. When pitching investors, then, it’s crucial that entrepreneurs do their research, understand what’s expected of them and pitch accordingly. Your ability to create impactful pitches has a direct impact on your ability to get your idea off the ground. Whether your trying to convince investors to believe in your idea, trying to win over the hearts of potential customers, or trying to land a critical partnership deal, your ability to articulate your vision is all they have to evaluate you on. Learn how to structure pitches that resonate the core values, offering and market of your idea in ways that instantly capture the attention of your audience. Whether its investors, angels, customers or partners, be certain you can get your intended message across. Scott is a self-proclaimed extrovert who has meshes a fascination with people and what motivates them, with a raw enthusiasm for technology. Scott is a founding member of Moven the mobile-centric payments business that helps customers to spend, save and live smarter. A founder at Next Bank, a mentor to Entrepreneurs throughout world with Lean Startup Machine, sits on the Board of educational empowering NGO, Care Pakistan and holds advisory positions at, Invitre, HUB Singapore and CDI Apps 4 Good. Scott’s energy transfers to the stage as a globally recognized speaker on The Digital Shift, Consumers, Mobility and Innovation. Scott has worked with various governments in Asia Pacific and Africa, taking on key advisory roles for countrywide infrastructure, and mobile commerce projects. As a multifaceted techie, he was instrumental in developing the mobile commerce space for markets in Malaysia, Singapore Cambodia, Indonesia and the Philippines. He is on a mission to transform mainstream thought processing around conventional business practices. Building insightful customer persona’s can ensure a meaningful connection between a business and it’s target customers. Personas tap into a fundamental human skill—the ability to make predictions about how other people will react based on mental models of them. One can often predict accurately how a close friend or family member will react to a particular event and decide how to act based on those inferences. A persona is a description of a fictional person representing a user segment of the software you are developing. Of course, the word “fictional” applies to the person not the description; that should be as grounded in reality as possible. Personas are one of the basic tools of User Experience (UX) design. The benefits to creating the personas collaboratively increases the accuracy and empathy of the persona and creates a level of awareness about the users that helps teams align around them..
Personas do not need to be complex to be useful. Begin by creating brief outlines of personas based on conversations with people who know the audience well, such as salespeople or customer service staff. Called “assumptive personas” because they are not based on actual data. Personas create the foundation for strong Customer Discovery and Validation. Lean Startup is a field-tested philosophy that provides you with a toolset to minimize failure and increase your chances of success. 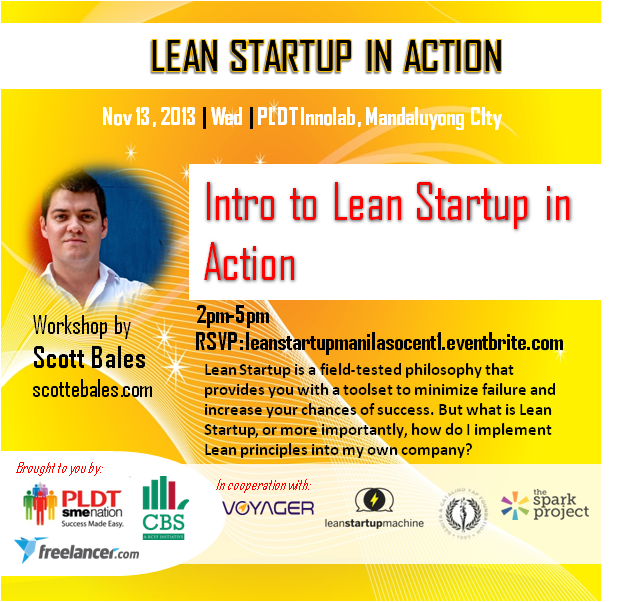 But what is Lean Startup, or more importantly, how do I implement Lean principles into my own company? Drawn from Eric Ries’ bestseller, this short introduction shows you how I drive successful ventures. I have been building startups for the past 7 years and have refined a practical approach to building “lean startups.” This is a science for transforming an idea to a functioning new business with minimal risk, wastage and learning. Learn why hundreds of companies, from financial services companies like Moven to social companies like Instagram to large corporations such as Intuit, Investec and News Corp are using this revolutionary technique. Lean Startup ideas are being applied more and more often in non-profits, B-corps and other mission-driven organizations. As the ideas have spread in this world, they’ve come to be known as Lean Impact, and best practices are emerging. In this webcast, Christie George of New Media Ventures and Akash Trivedi of Kiva.org will discuss key Lean Impact approaches. Their conversation will be followed by live Q&A with the webcast attendees, so come with your questions in mind. Lean Startup techniques aren’t just for young companies. In fact, they’ve been profitably applied in established companies like Intuit, GE, and Toyota. But there are particular challenges in bringing Lean Startup to enterprise corporations, and they aren’t always obvious. In this webcast, Eric Ries, Brant Cooper and Patrick Vlaskovits – all of whom have worked closely with Fortune 500 companies – will discuss some of the most common mistakes and paths to success that established firms can take in implementing Lean Startup methods. Their conversation will be followed by live Q&A with the webcast attendees, so come with your questions in mind. Patrick and Brant understand these problems intimately. They are the co-authors ofThe Lean Entrepreneur, and the co-founders of the Moves the Needle Group, which advises the innovation practices of Fortune 100 companies. Their webcast conversation with Eric began with a discussion of the ways that large companies come around to realizing they need to implement Lean Startup. Among other themes they covered: the conditions under which established companies implement Lean Startup; the hindrances and incentives they face; what individual employees can do to implement the methodology; and how to protect a company’s core business from the potential impact of experimentation. Though we’re posting a few highlights below, we encourage you to watch the video in its entirety, as Eric, Patrick and Brant dig into technical details and case studies that will be helpful for people engaged with this topic. The webcast conversation examined corporate versus startup structure, and the limitations on innovation that corporations create for themselves. Problems arise when companies isolate areas of the business in what Eric refers to as “functional silos”—independently operating teams (design, engineering, marketing, legal, etc.) that discretely address specific areas of the production chain. Each silo may be innovative in itself, but at some point it considers its work complete and hands off to the next silo, with which it has had little to no collaboration and for whose tradeoffs it has not accounted. What can Lean Startup do about this? Eric: I’ve now worked with a number of companies where once they adopt Lean Startup, it gives them a common vocabulary for all the different teams to use the same vocabulary, the same business-oriented, results set of concepts to wrap all these techniques in…. We knock the silos down and get everybody on a single, cross-functional team to say to everybody, look, you are a startup, you are not a set of different functions, so you, team…go experiment and learn how to make this happen. When teams are organized that way they’re so much more productive, so much more energized, the creativity you unlock is incredible. Brant: We’re still taught in MBA school is these silos, right? And if people can just imagine, if the way we motivate people, the way we do performance reviews, and incentivize people within silos—those measures cannot be drawn in a direct line to corporate objectives. You cannot draw a direct line to reducing waste or improving revenues or cutting costs…whereas the cross-functional teams, you can tie it to a performance metric that has a direct result in the corporate objectives. Patrick, with a bit of highly practical advice: One of the things Brant and I counsel large organizations, particularly ones that have already embraced Agile, is to extend the Agile metaphor into the funnel, for example, and show the benefit of Lean Startup for the sales and marketing teams, and then show the benefits of Lean Startup to the HR folks…. With sales and marketing experiments, often you pick low-hanging fruit in the millions of dollars very, very quickly. We’ve seen this time and time and time again, and that’s how you get other parts of the organization and other functional roles excited about starting LS methods. A variety of audience questions came in effectively asking how an established company, with an existing product, customer, and brand image, can make use of a minimum viable product (MVP) for experimentation purposes without damaging the larger company’s standing. Brant: The core business has to be protected from the startup. We separate out these startups. They need to exist in a different place for the time being, so that the startup is protected from the questions around return on investment, and the core business is protected from the startup…. So you’re not launching a minimum viable product to all of your core business customers–that’s a no-no. You have to keep these separate. And then the Lean Startup acts like a new startup. You have to go find your own customers to experiment with, you have your own brand, so you have to think like a Lean Startup. You’ve got your validated learning with the customer development you’ve been doing with your own market segment. But you’re not going to your core business. Patrick: The startup “can’t run to the core business and have all its problems solved for it. Because then you get something like the children of helicopter parents, that can’t fend for themselves. And ultimately if it’s a real innovation, that has real value and creates real value for customers, it has to fend for itself. It has to be a stand-alone business case that makes sense. Eric, on making lemonade out of an MVP lemon: The great thing about an MVP is that if customers don’t like it, but they care enough to complain, that’s actually great news. Most of the time when you do an MVP, no one even notices. Zero customers show up. You have “launch day” and then nothing happens, because your value proposition is so wrong that no one cares. So that doesn’t harm the brand. If people complain but you kept the scale of the product small–and MVP is about containing the scope of the experimentation so that the cost of failure is low–then you can make it right for those customers that complain. Like, you can send them a hand-engraved letter press apology. Every single one. Personally delivered to their house. By you. If that ever happens. Brant: Changing the culture is what’s needed and it’s hard and it takes time. And so I think if you’re a person inside of an organization that is ready for this type of stuff, the first thing you should do is go find like-minded people, and that’s actually how you start the process…. I’m not saying go do something that’s going to get you in trouble, but you can’t wait for some magic to happen, for some external force that says ok, now this company is prepared for Lean Startup culture. You actually have to go and make the change yourself. Patrick: Actually, let me go as far as to say you should go get in trouble, you shouldactually be subversive. I’m half-joking here, but I think we’ve all seen this, that where Lean Startup has managed to take root and flower is where initially you had some aggressive early-adopters act a little subversively. If you have a mortgage and a family, I’m not telling you to risk your career on adopting Lean Startup, but if you’re passionate about making change, you can’t wait for permission to do this stuff, you’ve got to start doing it and you’ve got to start doing it intelligently, and part of that is hacking the actual internal political system. That’s very difficult, obviously, but it’s part of that journey. Eric: Think of all the managers who worked at Kodak, or Nokia, or Blackberry–pick your favorite company that has had a total collapse in living memory. And say, “How would it feel to be the manager who was there, who saw the disruption coming and did nothing about it?” First of all, is that actually a good path to having a longterm career? If you have to feed a family and make your mortgage, and your company collapses while you’re there, is that really going to help you? I feel like it’s almost irresponsible to put your head down and say, “Whatever, I work for a great institution, and I’m going to let it crumble under my stewardship….” The future leaders of companies I think are going to be the people who today started learning with these techniques, because what we’re talking about here is nothing less than a full-scale paradigm change in the management culture and management philosophy of modern companies. So would you rather be an early adopter of that, or have someone else take that lead?